Here is how you use Onalytica IRM to attract more delegates to your events. 1/ Upload your event content such as descriptions, session tracks, brochures and speaker profiles to Onalytica IRM along with the names and social profiles of industry influencers; 1000s of them. The influencers can come from your own sources or be identified by Onalytica IRM. 2/ Onalytica IRM now automatically matches what the industry influencers say or share online with the most relevant content from your event and flags it up to your digital/social marketing team. 3/ Your marketing team tweet or email the influencer alerting them to the relevant piece of content on the event website. 4/ Because your event or session focuses on exactly what the influencer is focused on right now, the influencer often shares the link to the event provided by your marketing team. 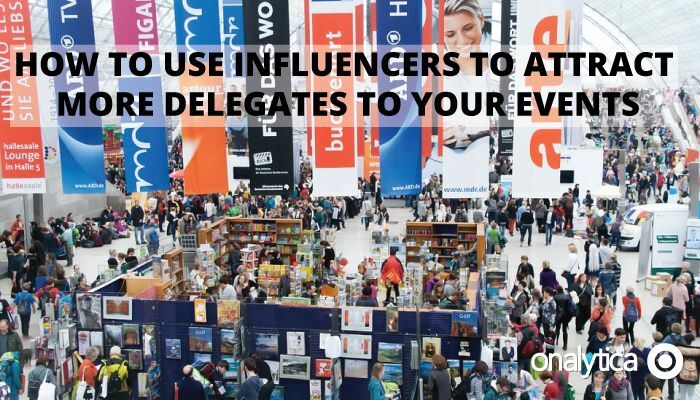 5/ When the influencer shares the information in his or her network it not only drives more delegates to the event, but it gets endorsed by an industry influencer. You can of course track and document the results and thereby demonstrate the ROI of the solution. Contact Onalytica for more information and a demo.